Chicken Marsala is an incredible easy recipe perfect for entertaining or family dinner. This is an impressive, yet easy, recipe for homemade Chicken Marsala that rivals any restaurant out there. Pair this Chicken Marsala recipe with roasted asparagus, and you have an show-stopping, delicious meal. Chicken Marsala is an Italian-American dish made from chicken cutlets, mushrooms, and Marsala wine. And it happens to be one of my most favorite meals ever. While Chicken Marsala is rich and complex in flavors and makes an elegant presentation, it is actually an easy dish to make at home. Chicken Marsala is my go to for quick, fuss-free impressive homemade meals. 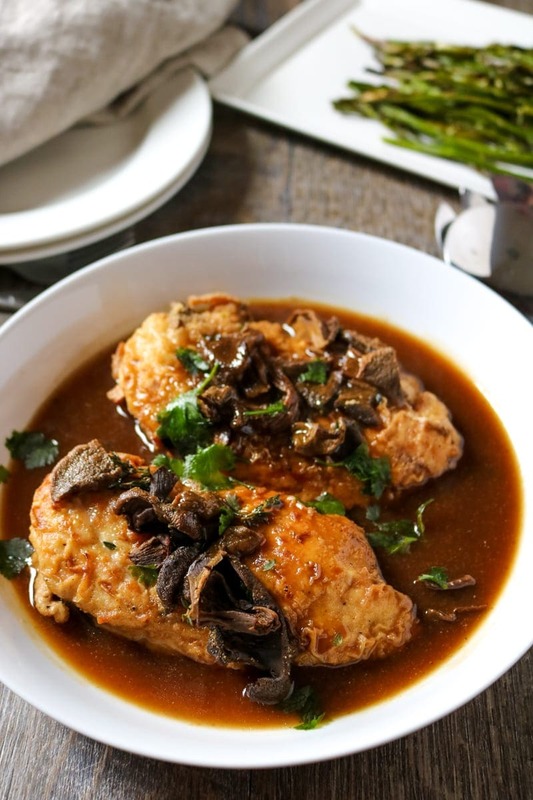 This Easy Chicken Marsala is restaurant quality, making it a great recipe to entertain with or just for a date night in. I have a secret tip to make the BEST Chicken Marsala, and this is a step you do NOT want to skip. Pro Tip: Re-hydrate dried mushrooms to create a rich homemade mushroom stock. The key to a really good Chicken Marsala recipe is the Marsala sauce. But the key to the sauce is more than just the Marsala wine. 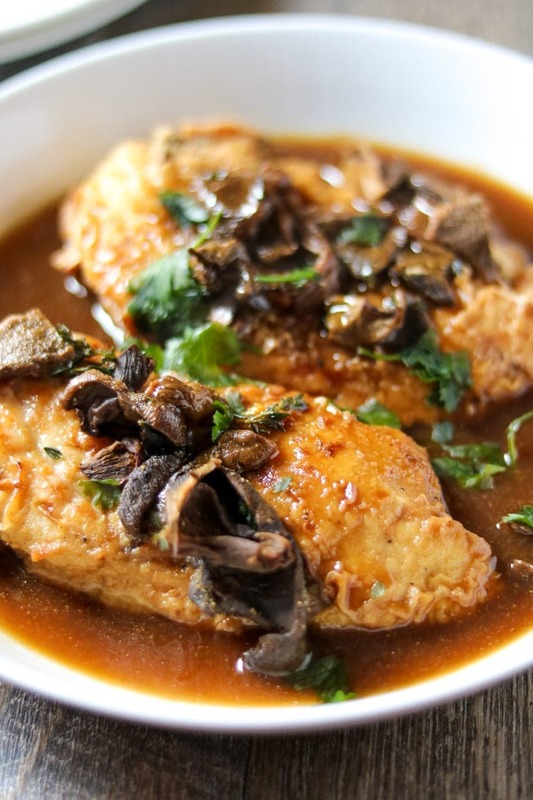 Mushrooms stock also plays a huge role in creating perfect Chicken Marsala. To save money and to create a rich homemade mushroom broth, I always start my Chicken Marsala with a pack of dried wild mushrooms. Cover dried mushrooms in 1 1/2 cups hot water and let soak anywhere from 10 minutes or overnight (overnight creates a much more flavorful mushroom stock, but if you forgot to plan, just soak long enough to soften mushrooms). Use your the soaking liquid and softened mushrooms in your Chicken Marsala for incredible flavor. Heat oil in large skillet over medium-high heat. While oil is heating, dredge chicken in seasoned flour. Coat chicken breast in flour. Sear the chicken on each side for 3-4 minutes, until browned. Remove the chicken from the skillet and place onto plate. Add in Marsala wine and scrape up any browned bits in skillet. Boil for 3 minutes, to evaporate the alcohol. Add the mushrooms, stock from the hydrated mushrooms, 1 teaspoon salt, 1/2 teaspoon pepper, seared chicken and thyme. Remove 2 tablespoons cooking liquid and whisk in cornstarch with the liquid. Whisk into chicken dish and stir until sauce is thickened, 2-3 minutes. I love to serve Chicken Marsala as a special date night meal in, but This recipe serves 4, so it is also a perfect family meal or one that is great to serve to dinner guests. You can skip the step of soaking mushrooms, if you make Instant Pot Chicken Marsala. If you need this to be Gluten-Free Chicken Marsala, use Bob’s Red Mill gluten free flour blend, for the dredging of the chicken. I have tried this with success several times. My Instant Pot Chicken Marsala is also Gluten-Free. I love to serve homemade Chicken Marsala with roasted asparagus–which is as simple as tossing one pound of asparagus with 1 tablespoon olive oil and 1 teaspoon kosher salt and roasting at 425 degrees for 20 minutes. An impressive, yet easy, recipe for homemade Chicken Marsala that rivals any restaurant out there. Pair this Chicken Marsala recipe with roasted asparagus, and you have an show-stopping, delicious meal. Submerge the mushrooms in 1 1/2 cups hot water for 10 minutes or up to 24 hours. (Do not discard the liquid). Dredge the chicken cutlets into flour that has been seasoned with 1 teaspoon each of salt and pepper. Shake off excess flour. Remove the chicken from the skillet. Add the Marsala wine to the skillet and bring to a boil. Boil for 3-4 minutes, while scraping off the browned bits of chicken. Add the mushrooms, stock from the hydrated mushrooms, 1 teaspoon salt, 1/2 teaspoon pepper, seared chicken and thyme. Reduce heat to low and simmer for 10 minutes. Serve the chicken and sauce over the roasted asparagus. delicious looking and sounding recipe for Chicken Marsala! Love asparagus but you can keep the mushrooms 🙂 thanks for sharing with us! What a special Date Night, we would love the Chicken Marsala. Hope you are having a great day and thanks so much for sharing your awesome post with Full Plate Thursday! Your pictures are awesome! Too bad I can’t eat a picture. Thanks for linking up to the Tasty Tuesdays Linky Party at Creative K Kids. 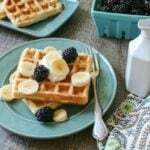 I have pinned this post to the Tasty Tuesdays Linky Party. Tammy, I love you for saying my pictures are awesome. I feel like that is my biggest weakness! What a terrific idea for Valentine’s Day! Though I love to order chicken Marsala when I’m out to eat, making it at home is even better!!! It has always been one of my favorites to order out, until I started making it at home with the dried mushrooms–game changer! Great idea foe a dinner in date night! Thanks for the smiles this morning. I think I will skip the heels, they don’t go with my pj’s , but I will run a brush through my hair. LOL…Chicken Marsala is one of our faves as well but I have never used the mushroom broth and dried mushrooms….thanks for the tip. Well happy to make you giggle Wendy! And the dried mushrooms and mushroom broth add a LOT! this looks delicious! I definitely plan to try this one. I love the dried mushrooms you added to this dish. They make everything so flavorful! Yes, they are a great way to have exotic flair with lots of flavor! LOVE your tips, Kristen. I will do my best to comb my hair and put on heels which match my PJs on Valentine’s Day =) Seriously, your Chicken Marsala with roasted asparagus is serious celebration food. Putting asparagus on my shopping list! LOL!!! I am mostly in PJs (sometimes heels) on Vday mysel I hope you love this Chicken Marsala as much as we do! Thanks Caroline and always happy to make people giggle! Kristen, this looks fantastic! Thanks for the time saving tip on using dehydrated mushrooms! I just want to sip that sauce with a spoon, Kristen. It looks so rich and flavorful! 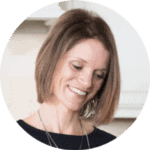 It is crazy flavorful Stacy–hope you give it a try. I love that you used dried mushrooms! I never thought to do that; I always use fresh. However, dried mushrooms really punch up the flavor and using the soaking water in the sauce is a great idea! 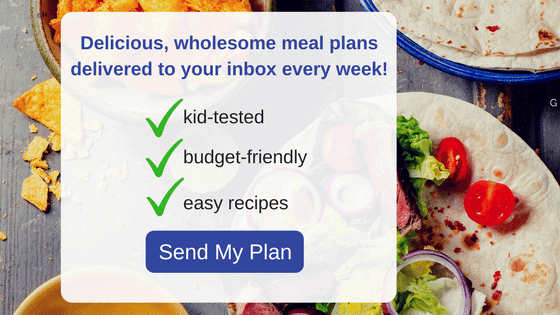 Carol, I hope you try the dried mushrooms–it really does punch up the flavor! My husband always orders chicken marsala at Italian restaurants. Would love to make it at home for him. However, putting the kids to bed early would yield in two frustrated people having chocolate for dinner. LOL!!! Well, maybe once your kids get a bit older the date night in can happen! It does get easier. And chocolate for dinner is not such a bad thing.